Audavoxx .com Founder Cheri Lasota has been a freelance editor, ebook designer and marketing consultant for the last 10 years. 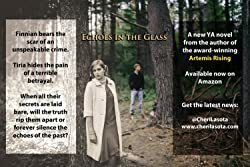 In addition, Cheri has written two novels and one nonfiction book and is currently writing a scifi trilogy, a scifi novella, and a fantasy series with co-author Auburn Seal. ECHOES IN THE GLASS is her second novel. Her bestselling debut novel, ARTEMIS RISING, is a 2013 Cygnus Awards First Place Winner and a 2012 finalist in the Next Generation Indie Books Awards. Cheri also recently released her how-to e-book DESIGN AND UPLOAD YOUR EPUB. Please enter your email address and click the Follow button to follow Cheri Lasota!